"A thrilling, fast-paced novel that offers exciting, fictionalized accounts of actual legal, political, and financial events that took place in the 1960s and 1970s. Tales of a sophisticated money-laundering scheme, political confrontation, sexual scandal, religious biases, and marital challenges all combine to engage and keep readers interested from the first page to the last. Not to be missed!" The Columbia Review. 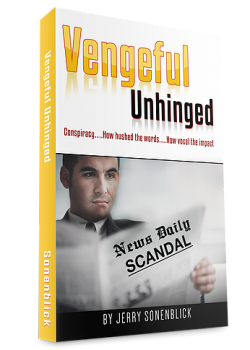 “Vengeful Unhinged” by Jerry Sonenblick is a legal/political novel that will engage and thrill literary minded readers who are interested in powerful, intense drama. The book is based on actual events that occurred throughout the 1960s/1970s and skillfully tackles issues of discrimination, financial crisis, political confrontation, and corruption. The story is set in the 1960s/1970s and follows David Sherwood, a lawyer with a sweet soul and strong determination to succeed. Driven by sadness resulting from a broken engagement and lost love, David is steady in his efforts to improve his life and grow his career. Unfortunately, he comes across a number of untoward characters, who are determined to bring him down. Mason Grewe, former lawyer turned Las Vegas crime gambling crook/international money-launderer, and Barney Stone, a wealthy, power hungry and prominent person in the community, both promise vengeance on David for interrupting their nefarious schemes. When US Senator Bart Langley, a friend of David’s, names David to replace him after he resigns from the Senate, Mason and Barney team up to interrupt David’s rise to success in the political world. They join forces to oppose the appointment and offer other candidates to take the position instead. But David may outwit the two of them again. We also learn about David’s challenges in his love life. He finally meets, falls in love with, and marries a woman named Mista. Though very much in love early on in the relationship, Mista becomes overwhelmed by the intensity of David’s life and eventually responds by isolating herself from the marriage and withdrawing from David. In Summary, “Vengeful Unhinged” by Jerry Sonenblick is a thrilling, fast-paced novel that offers exciting, fictionalized accounts of actual legal, political, and financial events that took place in the 1960s and 1970s. Tales of a sophisticated money-laundering scheme, political confrontation, sexual scandal, religious biases, and marital challenges all combine to engage and keep readers interested from the first page to the last. Not to be missed!